While visiting an estate in Ontario's Niagara Falls two years ago, a film enthusiast stumbled upon a rare World War I Richard Verascope stereo camera previously owned by the French Army. Here's what he found inside. The verascope camera, which was purchased by A Nerd's World's Chris Hughes, was found in pristine condition and included the original leather carrying case and glass slides. The antique had been in the possession of an elderly man who was clearing out his camera collection in preparation for retirement. 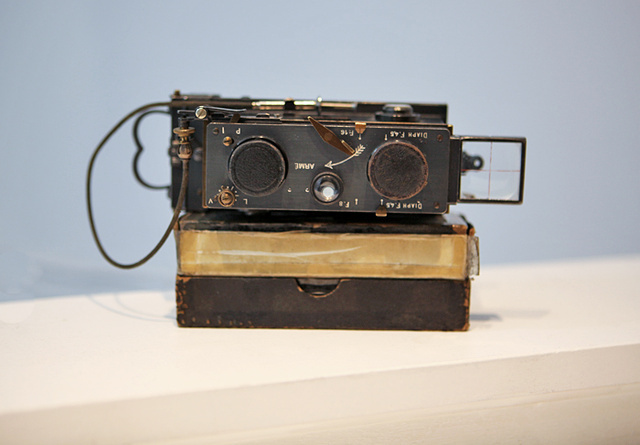 52 responses to "Rare 3D Camera Found Containing Photos from WWI"
Mesmerizing! Thank you for sharing. Love this site! Oh really that's a good news that Rare 3D Camera Found Containing Photos from WWI. I think has done hard work to finding and investing this 3d camera. • You have posted a very detail document. I read all of your article and I really like it, I understand your point of view. Hey I am so excited I found your weblog, I really found you by mistake, while I was browsing on Yahoo for something else, Nonetheless I am here now and would just like to say thank you for a fantastic post and a all round thrilling blog (I also love the theme/design), I don’t have time to read it all at the minute but I have saved it and also included your RSS feeds, so when I have time I will be back to read a lot more, Please do keep up the awesome job. to determine the topic. If you say it repeatedly, the only one The thing your readers must be aware of is because - it will be cripplingyour argument and that is at the top of the list of problems that you must avoid in your academic work. But [signs for novelty] courage, determination, and resolution [the opposite of surrender]. Understanding the subject - When writing essays, the first thing you have to do is define a niche. To ensure that these people will see the message you want to convey, write using their message language and writing while considering the amount of their understanding.